What Szostak is interested in finding out is how many different recipes there are for making life. How did life arise here on Earth, and might some other planet build life in a different way? Work in his lab is starting to yield some answers. "We're looking at a very narrow slice of the whole problem," Szostak says. "We assume we have the chemical building blocks of life: the question we're looking at is what do we need to do to make these chemicals get together and work like a cell?" Szostak, despite his humility, is a formidable figure in biochemistry– a Nobel laureate, Professor of Genetics at Harvard Medical School and a researcher at the Howard Hughes Medical Institute and Massachusetts General Hospital– and the project he is engaged in is, as he puts it, "one of the most interesting problems in chemistry." "The transition from chemistry to biology,"– from matter to life. In his laboratory, Szostak re-creates the chemistry of the early Earth, the planet before life began, in order to see how life's basic building blocks– lipids, nucleotides and amino acids — first assembled into larger structures such as membranes, RNA molecules and peptides. He wants to know how matter moved from the lifeless reactions of chemistry to the first simple living cells. Such primitive cells, or protocells (iamge below), would have been much simpler than any of today's modern cells, which have an organization based upon the "central dogma" of biology: DNA, containing a cell's genetic blueprint in a string of the nucleotide bases A, T, G, and C, is transcribed into RNA, and then factories called ribosomes translate the RNA into the sequences of twenty amino acids that make up proteins. These proteins run almost all of the operations of cells, from bacteria to humans: moving, metabolizing food, disposing of waste, speeding up and slowing down the chemical reactions that copy our genes. But in the beginning, there were no proteins: So how did cells evolve to create them? And how did the first cell evolve in the first place– and cross the border from chemistry into the new, living world of biology? Life was probably born in a small pond or lake, Szostak believes, not in an ocean, as many people think. Rain-fed pools provide a fresh water environment, compatible with the delicate cell membranes formed from simple fatty acids, which would be destroyed instantly in the salty oceans. Some such pond was the place where crucial elements were mixed, heated and cooled in the right sequence to become life. Inanimate molecules, congregated together inside a fatty skin, somehow became capable of replication, and of evolution: the definition of life, as Szostak sees it. Very likely, Szostak says, life began near a hydrothermal vent: an underwater spout of hot water, flowing into the cold water of an icy lake, much like modern Yellowstone Lake in winter. This, he believes, was the oven and freezer where the ingredients of life were cooked, cooled, thawed in the order required for nucleic acids to go through cycles of replication, and for fatty acid membranes to allow nutrients to enter into the cell. 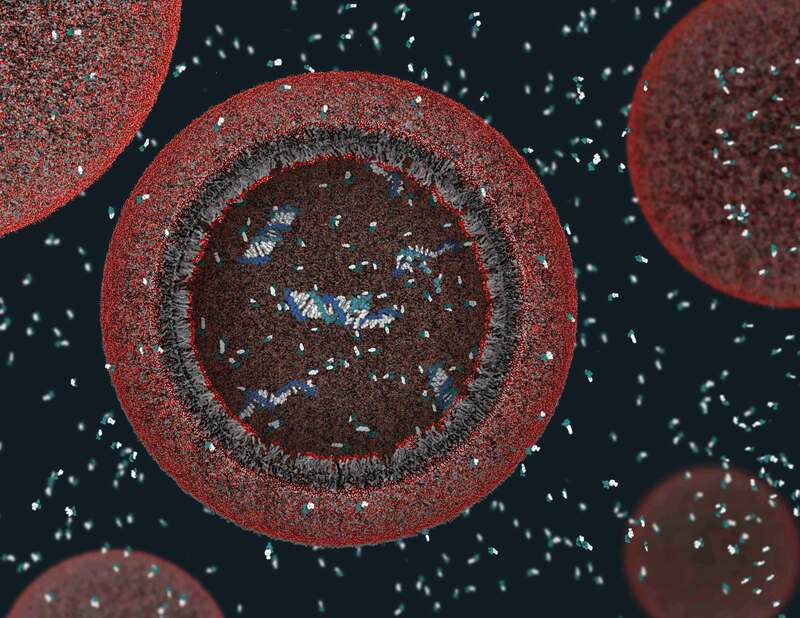 This first, simple "protocell," which Szostak is trying to recreate in the lab — nothing but a curl of genetic material surrounded by a fatty skin– started copying itself with minor variations, and these variations conferred advantages on some cells. This variety led to the competitive process of Darwinian evolution, Szostak says, and eventually to the tree of life as we know it today. "The key thing," Szostak says, "is to get started: to go from zero genes to one gene." This moment of "getting started" is the focus of Szostak's research: to discover the first "living chemistry", or, as Szostak puts it, "that transition from chemistry to biology": when a clump of molecules first became a living thing. Bit by bit, Szostak's efforts to bring molecules to life in the lab are shedding light on how life may have started, both here on Earth and elsewhere in the universe. Earth's Oxygen Engine: Is the Invisible Ocean Virus Ecosystem Threatened?